On day three of our outdoor adventure travels in Finland we ventured away from Helsinki to explore the rugged wilderness of the Finnish countryside. Our first stop was at Nuuksio National park where we went on a guided hike. Walking in the woods allowed us to experience scenic lakes and forest in natural setting. There is something remarkably therapeutic about being outside in the wild. The scenic outdoors in Finland is one of the most attractive features of the country where you can enjoy chopping wood, making a campfire and hiking to your heart’s content. Overall, if you plan to visit Finland be sure outdoors adventure activities are part of your itinerary. It is day three in Finland and today we are going for a walk in the woods. We’re here at Nuuksio National Park. On today’s outing we learned about Every Man’s Right in Finland. This is a traditional Finnish concept that allows people to camp out freely, to pick berries and mushrooms in the wild, to fish with a rod and line, and to walk, cycle, or ski anywhere on the land. To sum it up, Every Man’s Right means that everyone is free to enjoy the land. Where are you right now? Right now I’m in a woodshed and what is really cool is that the Finnish government provides wood for all of the National Parks. You can go out and make a fire here. Har! Har! Except, you don’t have any firewood. After hiking for a while, we cooked some sausages and enjoyed some sandwiches by the lake. It was a great way to spend a summer afternoon in Finland. And we’re kayaking again today. It is eight o’clock right now. It is calm. It is peaceful outside. It is still very light and we have the golden rays of the sun shining down on the water. 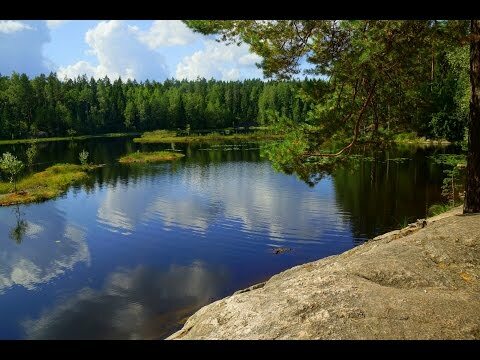 Wow, spectacular scenery, you’ve really made me want to visit Finland, it has never been somewhere that has interested me until I’ve watched your videos. Thanks for sharing. Thanks Darren! I’m really glad to hear that. It’s a country Audrey and I look forward to revisiting again soon.